In 1914, the territory of France was different from today's France in two important ways: most of Alsace and the northeastern part of Lorraine had been annexed by Germany in 1870 (following the Franco-Prussian War of 1870–71), and the North-African country of Algeria had been established as an integral part of France (a "département") in 1848. Alsace-Lorraine would be restored at the end of World War I (only to be lost again, temporarily, to the Germans a second time during World War II). not Unlike other European countries France did not experience a strong population growth in the mid and late 19th century and first half of the 20th century (see Demographics of France). This would be compounded by the massive French losses of World War I — roughly estimated at 1.4 million French dead including civilians (see World War I casualties) (or nearly 10% of the active adult male population) and four times as many wounded (see World War I) — and World War II — estimated at 593,000 French dead (one and a half times the number of U.S. dead), of which 470,000 were civilians (see World War II casualties). From a population of around 39 million in 1880, France still had only a population of 40 million in 1945. The post-war years would bring a massive "baby boom", and with immigration, France reached 50 million in 1968. This growth slowed down in 1974. The French far right expanded greatly and theories of race and anti-semitism proliferated in many quarters. Numerous far-right and anti-parliamentarian leagues, similar to the fascist leagues, sprang up, including colonel de la Rocque's Croix-de-Feu 1927-1936 which, like its larger rival the monarchist Action Française (founded in 1898, condemned by Pope Pius XI in 1926, Action Française supported a restoration of the monarchy and of Roman Catholicism as the state religion) advocated national integralism (the belief that society is an organic unity) and organized popular demonstrations in reaction to the Stavisky Affair 1934, hoping to overthrow the government (see 6 February 1934 crisis). Also see: 1920 in France. France tried vigorously without much success to obtain the reparations Germany had been forced to promise at the Treaty of Versailles. This led France to invade and occupy the Ruhr industrial district of Germany. That failed. Finally all the major nations agreed to accept the American proposals, known as the Dawes Plan of 1924 and the Young Plan of 1929, to stabilize reparation payments. Germany was virtually bankrupt by 1931, and all payments were suspended. After 1931 rising unemployment and political unrest led to the February 6, 1934 riots. The left banded together and formed the Popular Front, led by SFIO socialist leader Léon Blum, which won the elections in 1936. Ultra-nationalist groups also saw increased popularity, although democracy prevailed until 1940. Economic conditions did not significantly improve, even as the Popular Front reduce the workweek to 30 hours. Fearful of the Civil War inside France, such as was happening inside Spain, France led the major nations to call an arms blockade designed to prevent arms shipments to either side during the Spanish Civil War. That failed to stop arms shipments from Germany, Italy and the Soviet Union, but it Spanish politics from exploding. In September, 1939 Hitler invaded Poland, and France and Great Britain declared war. Both armies were mobilized to the Western Front, but for the next 8 months neither side made a move: this would be called the "Phony War". 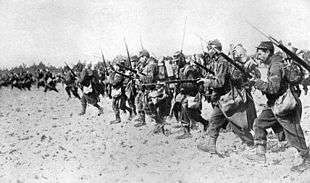 The German Blitzkrieg began its attack in May 1940, and in six weeks of savage fighting the French lost 130,000 men. The Allied armies crumbled, but the British managed to rescue Its own soldiers and about 100,000 French soldiers in the Dunkirk evacuation. After four years of occupation and strife, Allied forces, including Free France, liberated France in 1944. Paris was liberated on August 25, 1944. On September 10, 1944 Charles de Gaulle installed his provisional government in Paris. This time he remained in Paris until the end of the war, refusing to abandon even when Paris was temporarily threatened by German troops during the Battle of the Bulge in December 1944. But France could now again participate as a nation in the war. In 1945, French army numbered 1,300,000 men, 412,000 of whom were fighting in Germany and 40,000 in Italy. Social movements continued after May 1968. They included the occupation of the Lip factory in 1973, which led to an experience in workers' self-management, supported by the CFDT, the Unified Socialist Party (PSU) and all of the far-left movements. LIP workers participated to the Larzac demonstrations against the extension of a military camps (in which José Bové was present). Maoism and autonomism became quite popular in far-left movements, opposing both the Socialist Party and the Communist Party. In his term, unemployment averaged 10 percent, debt mounted, the French said no to Europe, and the suburban banlieues [Muslim suburbs] rioted....It was on his watch that France's competitive position sharply declined. His popularity sank to 16 percent....[But today] Jacques Chirac has emerged as an improbable icon of retro taste and a figure of public affection. ↑ Paul Beaudry, and Franck Portier. "The French depression in the 1930s." Review of Economic Dynamics(2002) 5#1 pp: 73-99 is an econometric study. ↑ Geoffrey Stewart, Dunkirk and the Fall of France (2008).